Between the two, Uber's stock is likely to perform better, but there are reasons to think that neither will be successful investments longer term. A world of cheap financing has completely transformed technology from a business of shipping bits to one of leveraging vast amounts of capital. Past examples include Amazon, Tesla, and Netflix. The latest stars burning through staggering amounts of cash are logistics companies Uber and Lyft, both based in San Francisco. The two firms filed confidential submissions with the U.S. Securities & Exchange Commission last week to go public, offerings that may come early in the new year for Lyft and perhaps soon after for Uber. Uber's offering could bring in as much as $25 billion, which would place it up there with 2014's float of Chinese retail giant Alibaba Group Holding (BABA - Get Report) . Investor sentiment will likely reward with an initial pop the almost limitless possibilities both companies see to plow money into new lines of business. But with the debt craze cooling as rates rise, these new issues may very well fizzle as 2019 grinds on. Between the two, Uber's stock is likely to perform better, as its larger market cap -- perhaps $120 billion at offer, versus $15 billion for Lyft -- aligns better with what appear to be much broader ambition. Uber's and Lyft's filings are the first salvo in a debt-laden roster for 2019 that includes likely IPOs from office space purveyor WeWork and data-mining outfit Palantir. They are coming to market at a time when technology IPOs have overwhelmingly been for money-losing companies, more so than at any other time in the IPO market, according to research cited by the Wall Street Journal. Gone are the days when tech companies' goals were to ship bits on a disc and reach very high profit margins in a respectable amount of time, a practice that enabled Microsoft to come to market in 1985 with an operating profit margin of 30%. In its most recent financial filings, Uber reported losing more than $1 billion on revenue of $2.95 billion, and The Wall Street Journal reported last month that Uber's has burned through more than $8 billion since it was founded nine years ago, and others report an even higher figure. Lyft is also sustaining heavy losses. 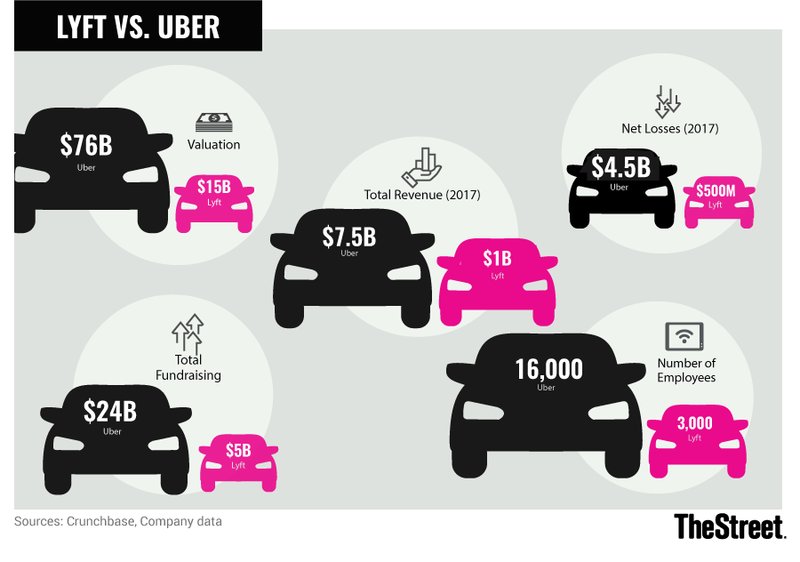 Uber has received equity and debt financing to the tune of $24 billion, while Lyft has raked in $5 billion since inception in 2012. That is the price to build an entire marketplace, as these new tech companies are doing. Just as Tesla has spent heavily to build energy infrastructure and to subsidize the sale of pricey cars, and just as Netflix has sustained deep off-balance-sheet content costs to build up a menu of video, Uber and Lyft have had to construct an entire economy of drivers to deliver cheap prices to smartphone users. A large part of the spend are payments both companies have to make to drivers to keep their wages at or just above above minimum wage, and also to subsidize fares for consumers at times. Billions more must be spent to develop technology for self-driving cars that may some day solve that driver problem for both firms. And new initiatives keep cropping up, such as Uber's announcement last month of Powerloop, a business that will lease tractor trailers and rent them out to businesses. Facilitating these expansions are the tremendous pools of money sloshing around the world, both the low-coupon debt and the masses of private equity ready to be deployed. Besides well-established venture funds such as Benchmark Capital, Uber has received funding from Japan's SoftBank Group (SFTBY , which has $92 billion at its disposal, and SoftBank's investment partner, Saudia Arabia's sovereign wealth fund, which has $225 billion. Despite the recent sag in markets, it's quite possible both Uber and Lyft will be greeted in the New Year with enthusiasm for their planned conquests. The ability to deploy vast amounts of capital makes these two machines for market expansion into any number of new businesses, including city-scale fleet management. Uber's chief executive, Dara Khosrowshahi, has said the potential market for all its services is worth $6 trillion. However, Uber has the better angle in that respect. If the reward in tech these days is for spending, then bigger is always better, and Uber has already shown it can paint a picture of opportunity spiraling outward from its main business with the UberEats delivery business that is now on track to generate $6 billion in food sales. The roadshows of these two will be an interesting exercise in sky-is-the-limit kinds of growth promises. Those tantalizing visions of new lines of business may well extend the fervor for the shares. And even better if both companies were to offer shares of stock to their ride-hailing drivers and customers. After an initial surge, however, expect both new offerings to fizzle. Massive amounts of insider share sales will be dumped on the market within a few months. And the other debt-laden behemoths such as Palantir and WeWork will pull some investor attention away from the duo. Combine that with rising interest rates that make for a less conducive environment for such debt-laden pursuits, and both Uber and Lyft will seem a bit like relics hailing a ride from the recent past.